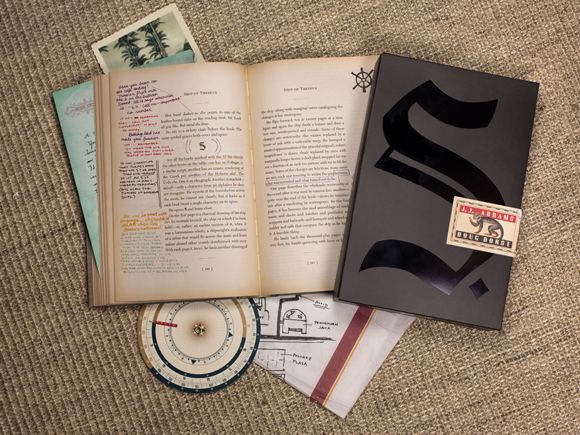 An Intermediate Guide to Reading “S” – by J.J. Abrams and Doug Dorst | Thoughts On "S"
very nice and well done! Your solution for the planetarium incident is really clever and logic. I though first that they were having a secret meeting there and Eric was showing the stars to Jen, since he worked there and must know how to do it. I though it could be one of their secret meeting places since they hide the book there for some time. Your solution seems more logic to me now! Does “Theseus” (also) mean “The S. &Us”, with “e” meaning “&” as in many Latin languages? Czechoslovakia existed from 30. October 1918, when it declared its independence from the Austro-Hungarian Empire. It is also an anniversary, isn’t it? Hi, thanks for the guide. I’m trying to verify some of the information I found concerning the cities. Could you help me? Sure. Comment here or email mystimus@gmail.com. Hi, thaks for the help. So I found P_ pretty quickly, you’re right about the quick internet search. Great! Agree – those are possibilities. A few thoughts 1) Corbeau makes reference to S seeing Sola in some “northern city” after he “sailed for weeks” on a southerly route (p116). This at least implies that Canada is probably too far north. 2) In the newspaper article about the bombing in B__, Ostrero and Pfeifer are referred to as “Mssrs.” – the plural of the French term “monsieur.” This implies that B__ is in France (but France is as far north as southern Canada and has few eastern coastlines) or a French colony/territory. If we really do rule out Canada for being too far North, then that seems to leave us with Europe or islands in the Atlantic under French rule/influence. I confess I am not a historian or geographer, so I don’t know if I’m mistaken or leaving out anything. Just thinking out loud to see if others agree/disagree or if it hopefully stirs more ideas. At at least one point the weight of someone is given in “stones” – indicating VMS is American on British? P356 in reference to the governor. “He is 18 stone of dead weight.” Doug Dorst is quite specific on the various types of trees and animals in the area, probably to help us find a real location where the territory could be. Is it possible that S is thinking in terms of the local region? Good catch, by the way. at first I have to thank you for your hard work. how do you know the “foreword was not written until Sunday, October 30, 1949”? and how would it be possible that it has been published on October 31, 1949? between writing the foreword and the publishing would be typesetting and printing, right? that’s not enough time. and Filomela refers to the foreword (i.g.) in fn 8 in chapter 10 so she must really have written it before translating the book or at least writing the footnotes? 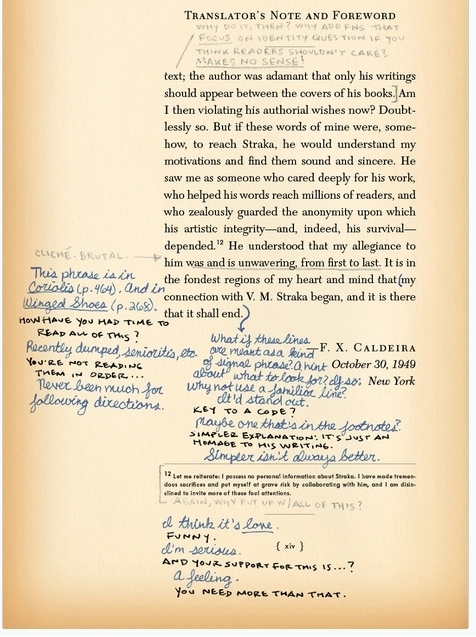 Caldeira dates her Foreword on xiv as October 30, 1949 – a Sunday, when the publishing house would have been closed. The publication date of Ship of Theseus on the copyright page is October, 1949, leaving only the next day to complete publication. I imagine that the book was completely ready to go, typeset, and had everything except the Foreword itself. Then on Monday, she simply dropped in her text into the Foreword and began running the presses. Great point on Fn8, Chapter 10. If my thoughts above provide an accurate picture, then she must have simply referred to what she knew she was going to write in the Foreword. Otherwise, yes, there is something else going on. 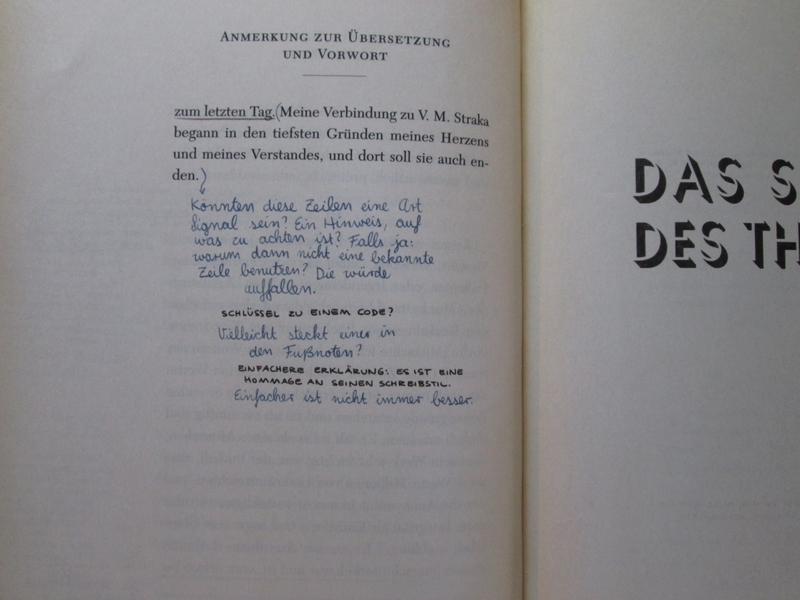 guess you must have thought I’m blind, but you will never believe me this without proof: in the german edition of the book the date is missing. just missing. not. there. I was searching everywhere like crazy, then I had a flash of genius and peeked inside the book at amazon UK “look inside”. and then my lower jaw just dropped. I read in a review that the german translation is even better, and then they leave out the date?! huh?! I’m just glad I found the link to Straka’s original ending here on your blog. made me cry. it’s much better than Filomela’s ending (sorry, Filomena!). Interesting. Thanks for sharing the differences. Perhaps the date is not as important as we think, other than it is the 39th anniversary of Vaclav Straka’s supposed leap from the Charles Bridge in Prague. And, not so coincidentally I’m sure, “Ship of Theseus” was published the same week that Signe Raabe turns 19 years old (see pp361 in the English version for Signe Rabe’s birthday: 11/4/1930). one starts to wonder what else is missing. hi! thanks for all your work on these posts!! it is amazing! i have just finnished reading the book, and I am going through all those theories and questions. but I saw in one of your posts that you say that Straka is the Signe’s father.. while I was reading, I thought Ekstorm was the father, specially because of Stenfalk and Corbeau relationship.. do you have more notes about this father theory? The presumed father is Ekstrom – you are correct. I have an unproven theory that Ekstrom is not the father, but Straka was. That Straka had an affair with Durand and that’s what made Signe so special. Otherwise, why must she be hidden away? Why did Straka go to such great lengths to protect not only her safety – but her very existence? How else did she end up with the true ending of “Ship of Theseus” (then gave it to Desjardins who gave it to FXC who had it mailed to Jen and Eric upon her death)? Why else would “Ship of Theseus” be published the same week that Signe Rabe turned 19 years old? Why else would Durand go to such great lengths to rename herself “A. Rabe” and have the father unidentified? All of these plus other indicators tell me that VMS was the father. I don’t think, Straka is Signe’s father — but of course she is special, and my therorie is that Straka was her second “uncle” (next to Summersby). both of them did everything they could to save the child from the agends in this neverending war (chapter 9, page 380, the red handwriting). she was born into it innocent; just imagine what would have happened, if the agends found her. and of course Durand let the father unidentified; any proven connection between the members of “the S” would have been dangerous for all of them. Pingback: What it Means to Follow the Monkey | Thoughts On "S"